Below you will find the educational information presented during the IDEAL CME/CE activity February 3-5, 2010 at the American Academy of Pain Medicine 2010 Annual Meeting. This material is provided for your information only. CME/CE credit was offered for participating during the live event only. Do most patients on long-term opioids develop some degree of physical dependence but rarely develop addictive disorders? Gourlay DL, Heit HA. 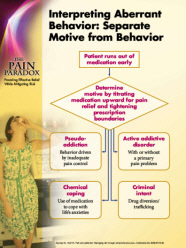 Pain and addiction: Managing risk through comprehensive care. J Addictive Dis 2008;27:23-30. Is it easy to determine who will become a problematic user of opioids? Gourlay DL, Heit HA, Almahrezi A. 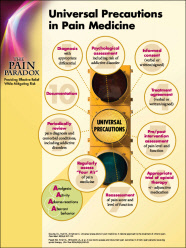 Universal precautions in pain medicine: A rational approach to the treatment of chronic pain. Pain Med. 2005;6:107-112. Passik SD, Kirsh KL, Whitcomb LA, et al. 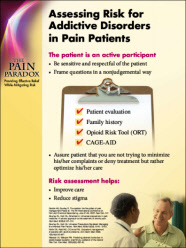 A new tool to assess and document pain outcomes in chronic pain patients receiving opioid therapy. Clin Ther 2004;26(4):552-61. Should patients with past drug abuse problems receive opioids? Gordon AS, Gourlay D. The problem: the seven stages of opioid prescribing. 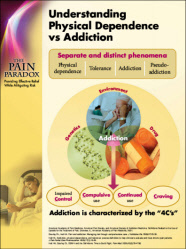 Poster at: The 7th International Conference on Pain and Chemical Dependency. June 22, 2007, New York, NY. Is the best course of action when a substance use disorder is identified in the acute setting to deny care and inform law enforcement authorities? Heit HA, Gourlay DL. The Treatment of Chronic Pain in Patients with History of Substance Abuse. In: Bonica’s Management of Pain. 4th ed. Ballantyne JC, Fishman SM, Rathmell JP, (eds.). Lippincott Williams and Wilkens. In Press. Should the Opioid Agreement initially set loose guidelines that can be made more stringent later in the event of aberrant behavior? Conversation: Paul Arnstein, PhD, RN, FNP-C, on How a 3-Hour Class for Patients on Long-Term Opioid Therapy Improved Compliance and Reduced Confusion. Topics in Pain Management. 2008;23:7-10. Is a patient who escalates his dose and returns early for a refill probably developing an addiction? Gourlay DL, Heit HA. 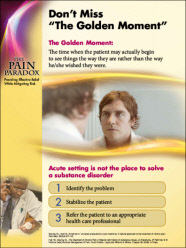 Pain and addiction: Managing risk through comprehensive care. J Addictive Dis. 2008;27:23-30. If a urine test shows the absence of the prescribed drug, is the drug probably being diverted? Heit HA, Gourlay DL. 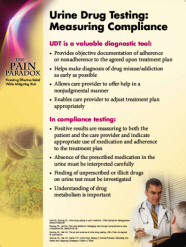 Urine drug testing in pain medicine. 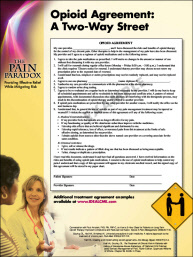 J Pain Symptom Management. 2004;27:260-267. Gourlay DL, Heit HA, Caplan YH. Urine Drug Testing in Clinical Practice: Dispelling the Myths and Designing Strategies, Edition 3, 2006. Gourlay DL, Heit HA. The art and science of urine drug testing. Clin J Pain. Accepted for publication. Do federal laws and regulations regarding the prescribing of controlled substances supersede state laws and regulations? Heit HA, Gilson AM. 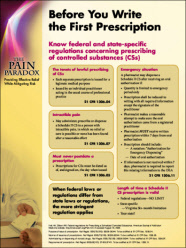 Federal regulations for prescribing scheduled controlled substances. American Society of Addiction Medicinewebsite. Available at: http://www.asam.org/Pain.html. The live certified CME activity presented at the American Academy of Pain Medicine was supported by an educational grant provided by Purdue Pharma L.P.